For other types of hybrid transportation, see Hybrid vehicle (disambiguation). The basic principle with hybrid vehicles is that the different motors work better at different speeds; the electric motor is more efficient at producing torque, or turning power, and the combustion engine is better for maintaining high speed (better than typical electric motor). Switching from one to the other at the proper time while speeding up yields a win-win in terms of energy efficiency, as such that translates into greater fuel efficiency, for example. Mopeds, electric bicycles, and even electric kick scooters are a simple form of a hybrid, powered by an internal combustion engine or electric motor and the rider's muscles. Early prototype motorcycles in the late 19th century used the same principle. In a parallel hybrid bicycle human and motor torques are mechanically coupled at the pedal or one of the wheels, e.g. using a hub motor, a roller pressing onto a tire, or a connection to a wheel using a transmission element. Most motorized bicycles, mopeds are of this type. In a series hybrid bicycle (SHB) (a kind of chainless bicycle) the user pedals a generator, charging a battery or feeding the motor, which delivers all of the torque required. They are commercially available, being simple in theory and manufacturing. The first published prototype of an SHB is by Augustus Kinzel (US Patent 3'884'317) in 1975. In 1994 Bernie Macdonalds conceived the Electrilite SHB with power electronics allowing regenerative braking and pedaling while stationary. In 1995 Thomas Muller designed and built a "Fahrrad mit elektromagnetischem Antrieb" for his 1995 diploma thesis. In 1996 Jürg Blatter and Andreas Fuchs of Berne University of Applied Sciences built an SHB and in 1998 modified a Leitra tricycle (European patent EP 1165188). Until 2005 they built several prototype SH tricycles and quadricycles. In 1999 Harald Kutzke described an "active bicycle": the aim is to approach the ideal bicycle weighing nothing and having no drag by electronic compensation. A SHEPB prototype made by David Kitson in Australia in 2014 used a lightweight brushless DC electric motor from an aerial drone and small hand-tool sized internal combustion engine, and a 3D printed drive system and lightweight housing, altogether weighing less than 4.5 kg. Active cooling keeps plastic parts from softening. The prototype uses a regular electric bicycle charge port. Hybrid power trains use diesel-electric or turbo-electric to power railway locomotives, buses, heavy goods vehicles, mobile hydraulic machinery, and ships. A diesel/turbine engine drives an electric generator or hydraulic pump, which powers electric/hydraulic motor(s) - strictly an electric/hydraulic transmission (not a hybrid), unless it can accept power from outside. With large vehicles conversion losses decrease, and the advantages in distributing power through wires or pipes rather than mechanical elements become more prominent, especially when powering multiple drives — e.g. driven wheels or propellers. Until recently most heavy vehicles had little secondary energy storage, e.g. batteries/hydraulic accumulators — excepting non-nuclear submarines, one of the oldest production hybrids, running on diesels while surfaced and batteries when submerged. Both series and parallel setups were used in WW2 submarines. The new Autorail à grande capacité (AGC or high-capacity railcar) built by the Canadian company Bombardier for service in France is diesel/electric motors, using 1500 or 25000 V on different rail systems. It was tested in Rotterdam, the Netherlands with Railfeeding, a Genesse and Wyoming company. Japan's first hybrid train with significant energy storage is the KiHa E200, with roof-mounted lithium ion batteries. In the US, General Electric made a locomotive with sodium - nickel chloride (Na-NiCl2) battery storage. They expect ≥10% fuel economy. Variant diesel electric locomotive include the Green Goat (GG) and Green Kid (GK) switching/yard engines built by Canada's Railpower Technologies, with lead acid (Pba) batteries and 1000 to 2000 hp electric motors, and a new clean burning ~160 hp diesel generator. No fuel is wasted for idling — ~60–85% of the time for these type locomotives. It is unclear if regenerative braking is used; but in principle it is easily utilized. Since these engines typically need extra weight for traction purposes anyway the battery pack's weight is a negligible penalty. The diesel generator and batteries are normally built on an existing "retired" "yard" locomotive's frame. The existing motors and running gear are all rebuilt and reused. Fuel savings of 40–60% and up to 80% pollution reductions are claimed over a "typical" older switching/yard engine. The advantages hybrid cars have for frequent starts and stops and idle periods apply to typical switching yard use. "Green Goat" locomotives have been purchased by Canadian Pacific Railway, BNSF Railway, Kansas City Southern Railway, and Union Pacific Railroad among others. Railpower Technologies engineers working with TSI Terminal Systems are testing a hybrid diesel electric power unit with battery storage for use in Rubber Tyred Gantry (RTG) cranes. RTG cranes are typically used for loading and unloading shipping containers onto trains or trucks in ports and container storage yards. The energy used to lift the containers can be partially regained when they are lowered. Diesel fuel and emission reductions of 50–70% are predicted by Railpower engineers. First systems are expected to be operational in 2007. Hybrid systems are coming into use for trucks, buses and other heavy highway vehicles. Small fleet sizes and installation costs are compensated by fuel savings,. [needs update] With advances such as higher capacity, lowered battery cost etc. Toyota, Ford, GM and others are introducing hybrid pickups and SUVs. Kenworth Truck Company recently introduced the Kenworth T270 Class 6 that for city usage seems to be competitive. FedEx and others are investing in hybrid delivery vehicles — particularly for city use where hybrid technology may pay off first. As of December 2013[update] FedEx is trialling two delivery trucks with Wrightspeed electric motors and diesel generators; the retrofit kits are claimed to pay for themselves in a few years. The diesel engines run at a constant RPM for peak efficiency. In 1978 students at Minneapolis, Minnesota's Hennepin Vocational Technical Center, converted a Volkswagen Beetle to a petro-hydraulic hybrid with off-the shelf components. A car rated at 32 mpg was returning 75 mpg with the 60 hp engine replaced by a 16 hp engine, and reached 70 mph. In the 1990s, engineers at EPA’s National Vehicle and Fuel Emissions Laboratory developed a petro-hydraulic powertrain for a typical American sedan car. The test car achieved over 80 mpg on combined EPA city/highway driving cycles. Acceleration was 0-60 mph in 8 seconds, using a 1.9 liter diesel engine. No lightweight materials were used. The EPA estimated that produced in high volumes the hydraulic components would add only $700 to the cost. Under EPA testing, a hydraulic hybrid Ford Expedition returned 32 mpg (7.4 L/100 km) City, and 22 mpg (11 L/100 km) highway. UPS currently has two trucks in service using this technology. Since 1985, the US military has been testing serial hybrid Humvees and have found them to deliver faster acceleration, a stealth mode with low thermal signature, near silent operation, and greater fuel economy. Ships with both mast-mounted sails and steam engines were an early form of hybrid vehicle. Another example is the diesel-electric submarine. This runs on batteries when submerged and the batteries can be re-charged by the diesel engine when the craft is on the surface. Newer hybrid ship-propulsion schemes include large towing kites manufactured by companies such as SkySails. Towing kites can fly at heights several times higher than the tallest ship masts, capturing stronger and steadier winds. When the term hybrid vehicle is used, it most often refers to a Hybrid electric vehicle. These encompass such vehicles as the Saturn Vue, Toyota Prius, Toyota Yaris, Toyota Camry Hybrid, Ford Escape Hybrid, Toyota Highlander Hybrid, Honda Insight, Honda Civic Hybrid, Lexus RX 400h and 450h, Hyundai Ioniq and others. A petroleum-electric hybrid most commonly uses internal combustion engines (using a variety of fuels, generally gasoline or Diesel engines) and electric motors to power the vehicle. The energy is stored in the fuel of the internal combustion engine and an electric battery set. There are many types of petroleum-electric hybrid drivetrains, from Full hybrid to Mild hybrid, which offer varying advantages and disadvantages. William H. Patton filed a patent application for a gasoline-electric hybrid rail-car propulsion system in early 1889, and for a similar hybrid boat propulsion system in mid 1889. There is no evidence that his hybrid boat met with any success, but he built a prototype hybrid tram and sold a small hybrid locomotive. In 1899, Henri Pieper developed the world's first petro-electric hybrid automobile. In 1900, Ferdinand Porsche developed a series-hybrid using two motor-in-wheel-hub arrangements with an internal combustion generator set providing the electric power; Porsche's hybrid set two speed records. While liquid fuel/electric hybrids date back to the late 19th century, the braking regenerative hybrid was invented by David Arthurs, an electrical engineer from Springdale, Arkansas in 1978–79. His home-converted Opel GT was reported to return as much as 75 mpg with plans still sold to this original design, and the "Mother Earth News" modified version on their website. Some battery electric vehicles (BEVs) can be recharged while the user drives. Such a vehicle establishes contact with an electrified rail, plate or overhead wires on the highway via an attached conducting wheel or other similar mechanism (see Conduit current collection). The BEV's batteries are recharged by this process—on the highway—and can then be used normally on other roads until the battery is discharged. For example, some of the battery-electric locomotives used for maintenance trains on the London Underground are capable of this mode of operation. Developing a BEV infrastructure would provide the advantage of virtually unrestricted highway range. Since many destinations are within 100 km of a major highway, BEV technology could reduce the need for expensive battery systems. Unfortunately, private use of the existing electrical system is almost universally prohibited. Besides, the technology for such electrical infrastructure is largely outdated and, outside some cities, not widely distributed (see Conduit current collection, trams, electric rail, trolleys, third rail). Updating the required electrical and infrastructure costs could perhaps be funded by toll revenue or by dedicated transportation taxes. Some electric trolleybuses can switch between an on-board diesel engine and overhead electrical power depending on conditions (see dual mode bus). 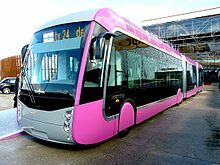 In principle, this could be combined with a battery subsystem to create a true plug-in hybrid trolleybus, although as of 2006[update], no such design seems to have been announced. Flexible-fuel vehicles can use a mixture of input fuels mixed in one tank — typically gasoline and ethanol, methanol, or biobutanol. Bi-fuel vehicle: Liquified petroleum gas and natural gas are very different from petroleum or diesel and cannot be used in the same tanks, so it would be impossible to build an (LPG or NG) flexible fuel system. Instead vehicles are built with two, parallel, fuel systems feeding one engine. For example, some Chevrolet Silverado 2500 HDs can effortlessly switch between petroleum and natural gas, offering a range of over 1000 km (650 miles). While the duplicated tanks cost space in some applications, the increased range, decreased cost of fuel, and flexibility where LPG or CNG infrastructure is incomplete may be a significant incentive to purchase. While the US Natural gas infrastructure is partially incomplete, it is increasing at a fast pace, and already has 2600 CNG stations in place. With a growing fueling station infrastructure, a large scale adoption of these bi-fuel vehicles could be seen in the near future. Rising gas prices may also push consumers to purchase these vehicles. When gas prices trade around $4.00, the price per MMBTU of gasoline is $28.00, compared to natural gas's $4.00 per MMBTU. On a per unit of energy comparative basis, this makes natural gas much cheaper than gasoline. All of these factors are making CNG-Gasoline bi-fuel vehicles very attractive. Some vehicles have been modified to use another fuel source if it is available, such as cars modified to run on autogas (LPG) and diesels modified to run on waste vegetable oil that has not been processed into biodiesel. Power-assist mechanisms for bicycles and other human-powered vehicles are also included (see Motorized bicycle). Hydraulic hybrid and pneumatic hybrid vehicles use an engine to charge a pressure accumulator to drive the wheels via hydraulic (liquid) or pneumatic (compressed air) drive units. In most cases the engine is detached from the drivetrain, serving solely to charge the energy accumulator. The transmission is seamless. Regenerative braking can be used to recover some of the supplied drive energy back into the accumulator. A French company, MDI, has designed and has running models of a petro-air hybrid engine car. The system does not use air motors to drive the vehicle, being directly driven by a hybrid engine. The engine uses a mixture of compressed air and gasoline injected into the cylinders. A key aspect of the hybrid engine is the "active chamber", which is a compartment heating air via fuel doubling the energy output. Tata Motors of India assessed the design phase towards full production for the Indian market and moved into "completing detailed development of the compressed air engine into specific vehicle and stationary applications". In petro-hydraulic hybrids, the energy recovery rate is high and therefore the system is more efficient than electric battery charged hybrids using the current electric battery technology, demonstrating a 60% to 70% increase in energy economy in US Environmental Protection Agency (EPA) testing. The charging engine needs only to be sized for average usage with acceleration bursts using the stored energy in the hydraulic accumulator, which is charged when in low energy demanding vehicle operation. The charging engine runs at optimum speed and load for efficiency and longevity. 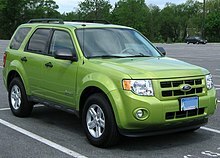 Under tests undertaken by the US Environmental Protection Agency (EPA), a hydraulic hybrid Ford Expedition returned 32 miles per US gallon (7.4 L/100 km; 38 mpg‑imp) City, and 22 miles per US gallon (11 L/100 km; 26 mpg‑imp) highway. UPS currently has two trucks in service using this technology. Although petro-hydraulic hybrid technology has been known for decades, and used in trains and very large construction vehicles, high costs of the equipment precluded the systems from lighter trucks and cars. In the modern sense an experiment proved the viability of small petro-hydraulic hybrid road vehicles in 1978. A group of students at Minneapolis, Minnesota's Hennepin Vocational Technical Center, converted a Volkswagen Beetle car to run as a petro-hydraulic hybrid using off-the shelf components. A car rated at 32 mpg‑US (7.4 L/100 km; 38 mpg‑imp) was returning 75 mpg‑US (3.1 L/100 km; 90 mpg‑imp) with the 60 hp engine replaced by a 16 hp engine. The experimental car reached 70 mph (110 km/h). PSA Peugeot Citroën exhibited an experimental "Hybrid Air" engine at the 2013 Geneva Motor Show. The vehicle uses nitrogen gas compressed by energy harvested from braking or deceleration to power a hydraulic drive which supplements power from its conventional gasoline engine. The hydraulic and electronic components were supplied by Robert Bosch GmbH. Mileage was estimated to be about 118 mpg‑US (2 L/100 km; 142 mpg‑imp) on the Euro test cycle if installed in a Citroën C3 type of body. PSA Although the car was ready for production and was proven and feasible delivering the claimed results, Peugeot Citroën were unable to attract a major manufacturer to share the high development costs and are shelving the project until a partnership can be arranged. Another form of hybrid vehicle are human power-electric vehicles. These include such vehicles as the Sinclair C5, Twike, electric bicycles, and electric skateboards. The first mass production parallel hybrid sold outside Japan was the 1st generation Honda Insight. These types use a generally compact electric motor (usually <20 kW) to provide auto-stop/start features and to provide extra power assist during the acceleration, and to generate on the deceleration phase (aka regenerative braking). On-road examples include Honda Civic Hybrid, Honda Insight 2nd generation, Honda CR-Z, Honda Accord Hybrid, Mercedes Benz S400 BlueHYBRID, BMW 7 Series hybrids, General Motors BAS Hybrids, Suzuki S-Cross, Suzuki Wagon R and Smart fortwo with micro hybrid drive. In a power-split hybrid electric drive train there are two motors: a traction electric motor and an internal combustion engine. The power from these two motors can be shared to drive the wheels via a power split device, which is a simple planetary gear set. The ratio can be from 100% for the combustion engine to 100% for the traction electric motor, or anything in between, such as 40% for the electric motor and 60% for the combustion engine. The combustion engine can act as a generator charging the batteries. Modern versions such as the Toyota Hybrid Synergy Drive have a second electric motor/generator connected to the planetary gear. In cooperation with the traction motor/generator and the power-split device this provides a continuously variable transmission. Passenger car installations include Toyota Prius, Ford Escape and Fusion, as well as Lexus RX400h, RX450h, GS450h, LS600h, and CT200h. Chevrolet Volt, a series hybrid plug-in hybrid, also called extended range electric vehicle (EREV). A series- or serial-hybrid vehicle is driven by an electric motor, functioning as an electric vehicle while the battery pack energy supply is sufficient, with an engine tuned for running as a generator when the battery pack is insufficient. There is typically no mechanical connection between the engine and the wheels, and the primary purpose of the range extender is to charge the battery. Series-hybrids have also been referred to as extended range electric vehicle, range-extended electric vehicle, or electric vehicle-extended range (EREV/REEV/EVER). The BMW i3 with Range Extender is a production series-hybrid. It operates as an electric vehicle until the battery charge is low, and then activates an engine-powered generator to maintain power, and is also available without the range extender. The Fisker Karma was the first series-hybrid production vehicle. When describing cars, the battery of a series-hybrid is usually charged by being plugged in - but a series-hybrid may also allow for a battery to only act as a buffer (and for regeneration purposes), and for the electric motor's power to be supplied constantly by a supporting engine. Series arrangements have been common in diesel-electric locomotives and ships. Ferdinand Porsche effectively invented this arrangement in speed-record-setting racing cars in the early 20th century, such as the Lohner-Porsche Mixte Hybrid. Porsche named his arrangement "System Mixt" and it was a wheel hub motor design, where each of the two front wheels was powered by a separate motor. This arrangement was sometimes referred to as an electric transmission, as the electric generator and driving motor replaced a mechanical transmission. The vehicle could not move unless the internal combustion engine was running. In 1997 Toyota released the first series-hybrid bus sold in Japan. GM introduced the Chevy Volt series plug-in hybrid in 2010, aiming for an all-electric range of 40 mi (64 km), though this car also has a mechanical connection between the engine and drivetrain. Supercapacitors combined with a lithium ion battery bank have been used by AFS Trinity in a converted Saturn Vue SUV vehicle. Using supercapacitors they claim up to 150 mpg in a series-hybrid arrangement. The Toyota Prius Prime has an all-electric range of 25 mi (40 km). The Ford Fusion Energi is a plug-in hybrid with an all-electric range of 21 mi (34 km). Another subtype of hybrid vehicles is the plug-in hybrid electric vehicle (PHEV). The plug-in hybrid is usually a general fuel-electric (parallel or serial) hybrid with increased energy storage capacity, usually through a lithium-ion battery, which allows the vehicle to drive on all-electric mode a distance that depends on the battery size and its mechanical layout (series or parallel). It may be connected to mains electricity supply at the end of the journey to avoid charging using the on-board internal combustion engine. The Nissan Leaf was the first plug-in electric car equipped with Nissan's Vehicle Sound for Pedestrians. A 2009 National Highway Traffic Safety Administration report examined hybrid electric vehicle accidents that involved pedestrians and cyclists and compared them to accidents involving internal combustion engine vehicles (ICEV). The findings showed that, in certain road situations, HEVs are more dangerous for those on foot or bicycle. For accidents where a vehicle was slowing or stopping, backing up, entering or leaving a parking space (when the sound difference between HEVs and ICEVs is most pronounced), HEVs were twice as likely to be involved in a pedestrian crash than ICEVs. For crashes involving cyclists or pedestrians, there was a higher incident rate for HEVs than ICEVs when a vehicle was turning a corner. But there was no statistically significant difference between the types of vehicles when they were driving straight. Several automakers developed electric vehicle warning sounds designed to alert pedestrians to the presence of electric drive vehicles such as hybrid electric vehicle, plug-in hybrid electric vehicles and all-electric vehicles (EVs) travelling at low speeds. Their purpose is to make pedestrians, cyclists, the blind, and others aware of the vehicle's presence while operating in all-electric mode. Vehicles in the market with such safety devices include the Nissan Leaf, Chevrolet Volt, Fisker Karma, Honda FCX Clarity, Nissan Fuga Hybrid/Infiniti M35, Hyundai ix35 FCEV, Hyundai Sonata Hybrid, 2012 Honda Fit EV, the 2012 Toyota Camry Hybrid, 2012 Lexus CT200h, and all Prius family cars recently introduced, including the standard 2012 model year Prius, the Toyota Prius v, and the Toyota Prius Plug-in Hybrid. 2. The three most popular hybrid vehicles, Honda Civic, Honda Insight and Toyota Prius, set the standards even higher by producing 4.1, 3.5, and 3.5 tons showing a major improvement in carbon dioxide emissions. Hybrid vehicles can reduce air emissions of smog-forming pollutants by up to 90% and cut carbon dioxide emissions in half. Regenerate Braking. [further explanation needed]The drivetrain can be used to convert kinetic energy (from the moving car) into stored electrical energy (batteries). The same electric motor that powers the drivetrain is used to resist the motion of the drivetrain. This applied resistance from the electric motor causes the wheel to slow down and simultaneously recharge the batteries. Other types of green vehicles include other vehicles that go fully or partly on alternative energy sources than fossil fuel. Another option is to use alternative fuel composition (i.e. biofuels) in conventional fossil fuel-based vehicles, making them go partly on renewable energy sources. Other approaches include personal rapid transit, a public transportation concept that offers automated on-demand non-stop transportation, on a network of specially built guideways. Automakers spend around $US8 million in marketing Hybrid vehicles each year. With combined effort from many car companies, the Hybrid industry has sold millions of Hybrids. Hybrid car companies like Toyota, Honda, Ford and BMW have pulled together to create a movement of Hybrid vehicle sales pushed by Washington lobbyist to lower the worlds emissions and become less reliant on our petroleum consumption. In 2005, sales went beyond 200,000 Hybrids, but in retrospect that only reduced the global use for gasoline consumption by 200,000 gallons per day — a tiny fraction of the 360 million gallons used per day. According to Bradley Berman author of Driving Change—One Hybrid at a time, "Cold economics shows that in real dollars, except for a brief spike in the 1970s, gas prices have remained remarkably steady and cheap. Fuel continues to represent a small part of the overall cost of owning and operating a personal vehicle". Other marketing tactics include greenwashing which is the "unjustified appropriation of environmental virtue." Temma Ehrenfeld explained in an article by Newsweek. Hybrids may be more efficient than many other gasoline motors as far as gasoline consumption is concerned but as far as being green and good for the environment is completely inaccurate. Hybrid car companies have a long time to go if they expect to really go green. According to Harvard business professor Theodore Levitt states "managing products" and "meeting customers' needs", "you must adapt to consumer expectations and anticipation of future desires." This means people buy what they want, if they want a fuel efficient car they buy a Hybrid without thinking about the actual efficiency of the product. This "Green Myopia" as Ottman calls it, fails because marketers focus on the greenness of the product and not on the actual effectiveness. Researchers and analysts say people are drawn to the new technology, as well as the convenience of fewer fill ups. Secondly, people find it rewarding to own the better, newer, flashier, and so called greener car. In the beginning of the Hybrid movement car companies reached out to the young people, by using top celebrities, astronauts, and popular TV shows to market Hybrids. This made the new technology of Hybrids a status to obtain for many people and a must to be cool or even the practical choice for the time. With the many benefits and status of owning a Hybrid it is easy to think it's the right thing to do, but in fact may not be as green as it appears. While the adoption rate for hybrids in the US is small today (2.2% of new car sales in 2011), this compares with a 17.1% share of new car sales in Japan in 2011, and it has the potential to be very large over time as more models are offered and incremental costs decline due to learning and scale benefits. However, forecasts vary widely. For instance, Bob Lutz, a long-time skeptic of hybrids, indicated he expects hybrids "will never comprise more than 10% of the US auto market." Other sources also expect hybrid penetration rates in the US will remain under 10% for many years. ^ "What is a Hybrid Vehicle?". What-is-what.com. Retrieved 2013-04-22. ^ Das Power bike (in German). ISBN 978-3-89595-123-7. Retrieved 2007-02-27. ^ Fuchs, Andreas (1999). Velomobile Seminar. ISBN 978-3-9520694-1-7. Retrieved 2006-01-11. ^ "Greetings Ecological Transportation Futurist". MCN.org. Archived from the original on 2005-11-10. Retrieved 2013-04-30. ^ "Welcome to the electronic cycle site". bluewin.ch. 2015-05-06. Archived from the original on 2015-10-16. Retrieved 2013-04-22. ^ "Australian man builds the first ever hybrid petrol/electric bicycle using UP Mini 3D printer". Archived from the original on 2015-08-22. ^ "Van Hool presents the ExquiCity Design Mettis". Archived from the original on 2013-06-05. Retrieved 2012-06-05. ^ "The World's First Hybrid Train Officially Enters Commercial Service". ENN.com. 2007-10-24. Retrieved 2012-01-13. ^ "Japan to launch first hybrid trains". The Sydney Morning Herald. AP digital. 2007-07-29. Retrieved 2013-04-30. ^ "CNG-Diesel train launch in India". Times of India. 2015-01-15. Retrieved 2015-04-22. ^ RailPower Technologies (2006-07-12). "GG Series: Hybrid Yard Switcher" (PDF). Archived from the original (PDF) on 2009-03-20. ^ "RailPower To Supply TSI Terminal Systems Inc. with hybrid power plants for rubber tyred gantry cranes" (PDF) (Press release). 2006-10-10. Archived from the original (PDF) on 2008-02-28. ^ "Railpower to supply TSI Terminal Systems Inc. with hybrid power plants for rubber tyred gantry cranes" (Press release). RailPower Technologies Corp. 2006-10-10. ^ Thomas, Justin (2007-03-27). "Hybrid Truck Unveiled by Kenworth". TreeHugger. ^ "Kenworth Unveils T270 Class 6 Hybrid Truck Targeted at Municipal, Utility Applications" (Press release). Kenworth Truck Company. 2007-03-21. Archived from the original on 2009-03-01. ^ Golson, Jordan (2014-09-30). "FedEx's New Electric Trucks Get a Boost From Diesel Turbines". Wired. Condé Nast. Retrieved 2014-10-01. ^ a b "Try a Hydraulic Drive Train: This Car of the Future Gets 75 MPG". Mother Earth News. March–April 1978. Archived from the original on 2012-10-25. Retrieved 2013-04-22. ^ a b c d e "Demonstration Vehicles". Epa.gov. 2012-10-18. Retrieved 2013-04-22. ^ a b Capturing the power of hydraulics. AutoblogGreen. Retrieved on 2012-04-18. ^ a b EPA unveils hydraulic hybrid UPS delivery truck. Autoblog. Retrieved on 2012-04-18. ^ Komarow, Steven (2006-02-13). "Military hybrid vehicles could boost safety, mobility". USA Today. ^ "Hybrid Electric HMMWV". GlobalSecurity.Org. Retrieved 2008-11-17. ^ Namowitz, Dan (2011-12-20). "AOPA ONLINE". Thomas A. Horne. Retrieved 2018-05-10. ^ "The Patton Motor". The Street Railway Journal. VII (10): 513–514. October 1891. ^ "The Patton Motor Car". English Mechanic and World of Science (1713): 524. 1898-01-21. ^ "Bi-Fuel Silverado 2500HD Can Switch Between Gasoline And Natural Gas". Retrieved 2013-03-31. ^ "Alternative Fueling Station Counts by State". Retrieved 2013-03-31. ^ Halber, Deborah. "What is the energy of gasoline compared to the same cost of other fuels in BTUs per dollar?". Archived from the original on 2013-04-06. Retrieved 2013-03-31. ^ "Learn everything about the compressed air cars!". Aircars.tk. Archived from the original on 2013-05-20. Retrieved 2013-04-30. ^ "MDI's air engine technology tested on Tata Motors vehicles" (Press release). Tata Motors. 2012-05-07. Archived from the original on 2013-05-09. Retrieved 2013-04-22. ^ "Tata Motors enters second phase of air-car development". Gizmag.com. 2013-05-07. Retrieved 2013-04-22. ^ "On-road". Archived from the original on 2015-05-25. Retrieved 2015-05-30. ^ mmh.com (2011-08-01). "Lift Trucks: 15 ways the lift truck is evolving - Article from Modern Materials Handling". Modern Materials Handling. Retrieved 2013-04-22. ^ Proefrock, Philip (2010-03-25). "Hybrid Hydraulic Drive Vehicle Promises 170 MPG". Inhabitat. Retrieved 2013-04-22. ^ Turpen, Aaron (2012-02-15). "INGOCAR from Valentin Tech shatters the way we think about cars". Torquenews.com. Retrieved 2013-04-22. ^ "Welcome". Valentintechnologies.com. Archived from the original on 2013-04-21. Retrieved 2013-04-22. ^ Hanlon, Mike (2011-01-26). "Chrysler announces development of hydraulic hybrid technology for cars". Gizmag.com. Retrieved 2013-04-22. ^ "EPA and Chrysler to Take Latest Hybrid Technology from Lab to Street/Partnership to adapt fuel efficient technology" (Press release). Yosemite.epa.gov. 2011-01-19. Retrieved 2013-04-22. ^ "Hydraulic Hybrid Research". US EPA. 2010-10-18. Retrieved 2013-04-22. ^ Tim Lewis (2013-03-23). "Peugeot's Hybrid Air: the car of the future that runs on air". The Observer The Guardian. Retrieved 2013-03-25. ^ "A Pair of Peugeots Debuts in Paris: One Prescient (and Possibly Good for 118 mpg), One Practical". 2014-10-02. ^ Jolly, David (2013-03-01). "Compressing Gas for a Cheaper, Simpler Hybrid". The New York Times. Retrieved 2013-03-02. ^ "PSA Peugeot Citroen seeks partners for Hybrid Air tech". ^ "Honda IMA technology". Honda Motor. Retrieved 2009-05-01. ^ "Toyota debuts power-hybrid bus | The Japan Times Online". Search.japantimes.co.jp. 1997-08-22. Retrieved 2009-10-17. ^ Stossel, Sage (2008-05-06). "Electro-Shock Therapy – The Atlantic (July/August 2008)". The Atlantic. Retrieved 2009-10-17. ^ California Cars Initiative. "All About Plug-In Hybrids (PHEVs)". International Humanities Center. Retrieved 2013-05-01. ^ "Prius PHEV". Electric Auto Association – Plug in Hybrid Electric Vehicle. Retrieved 2012-01-14. ^ "Incidence of Pedestrian and Bicyclist Crashes by Hybrid Electric Passenger Vehicles at Journalist's Resource.org". 2011-03-07. ^ American Council of the Blind Press Release (2010-12-16). "Critical Pedestrian Safety Legislation Moves to White House for President's Signature". PR Newswire. Retrieved 2010-12-17. ^ "S. 841 Pedestrian Safety Enhancement Act of 2010". Legislative Digest. 2010-12-15. Archived from the original on 2010-12-22. Retrieved 2010-12-17. ^ Larry Dignan (2010-12-16). "Hybrid, electric vehicles to become louder for pedestrian safety". SmartPlanet.com. Archived from the original on 2010-12-19. Retrieved 2010-12-17. ^ Garcia, J. (2008). "Air Quality: Vehicle Emissions and Air Quality". Idaho Department of Environmental Quality. Archived from the original on 2010-01-17. Retrieved 2009-11-22. ^ "Does hybrid car production waste offset hybrid benefits?". 2010-12-06. ^ "How Do Hybrid Vehicles Impact the Environment? - Physics 139 eck". ^ "Plug-in Hybrids". Retrieved 2015-05-30. ^ John Voelcker. "Electric-Car Battery Use: Already Higher Than Hybrids' Total?". Green Car Reports. Retrieved 2015-05-30. ^ Haxel, G; J. Hedrick; J. Orris (2002). "Rare earth elements critical resources for high technology" (PDF). USGS Fact Sheet: 087‐02. Fact Sheet. Reston, VA, USA: United States Geological Survey. doi:10.3133/fs08702. ^ a b Lunn, J. (2006-10-03). "Great western minerals" (PDF). London. Archived from the original (PDF) on 2013-06-04. Retrieved 2013-04-30. ^ "Hybrid Cars Technology Overviews". www.green-vehicles.com. Retrieved 2015-11-16. ^ Marc Carter. "Peugeot Announces Plans to Release a Hybrid Car That Runs on Compressed Air by 2016". Retrieved 2015-05-30. ^ "What is a self-charging hybrid?". DrivingElectric. Retrieved 2019-04-17. ^ Shah, Saurin D. (2009). "2 Electrification of Transport and Oil Displacement". In Sandalow, David. Plug-In Electrical Vehicles: What Role for Washington. Brookings Institution. ISBN 978-0-8157-0305-1. Retrieved 2011-08-11. ^ "EU agrees deal on 2020 car emissions regulations". Retrieved 2015-05-30. Wikimedia Commons has media related to Hybrid-powered vehicles.